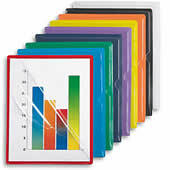 Our vinyl arrangers are popular and are just right for the office, home or classroom. With a two sided opening and a thumb notch for easy access, their 8-gauge clear front and durable vinyl back protects your paperwork from spills, stains and everyday wear. All of our arrangers have clear covers for quick at-a-glance ease. You can organize and color-code everything from memos to contracts to presentations, and transport or present documents in a way that's both practical and attentively arranged. Doctor Stuff now carries two lines of paperwork arrangers to help service your needs better; the traditional version and a premium version with a rigid back. Both lines are in stock and ready to ship. We offer letter and legal sized arrangers, as well as arrangers with tabs, arrangers with business card slits (great for proposals and important presentations), as well as arrangers with three sealed sides (pockets). Compatibility: We have fielded numerous calls due to the apparent closure of Century Business Solutions and their related companies (New Century Direct, FileRite, etc.) Our traditional Paperwork Arrangers are made to the exact specifications as the ones sold by Century Business Solutions and are covered by a 30 day unconditional guarantee to give you added assurance. See our Shipping & Returns page for more details about our guarantee, as well as our Frequently Asked Questions page. Samples: Given the experiences that many have had with not getting their products from other companies, we understand that some may be apprehensive about ordering from a different company. We are happy to send out a sample of our product so that you can be comfortable in your purchase. Just call us at 877-DR-STUFF.